IDT is the transform which convert camera specific color space into common ACES color space. 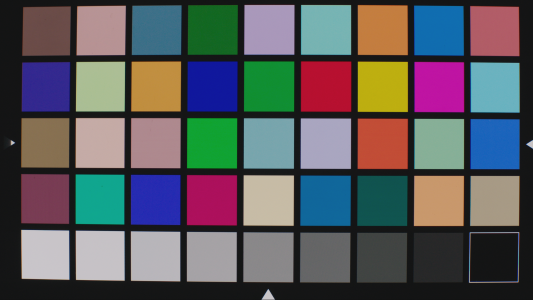 ACES color space is the device independent color space and this IDT conversion is the first step of ACES workflow. Camera makers who is announced to support ACES is providing their own designed IDT for their cameras. Recently, more and more software implemented these IDTs so not a few users would have used these transform. 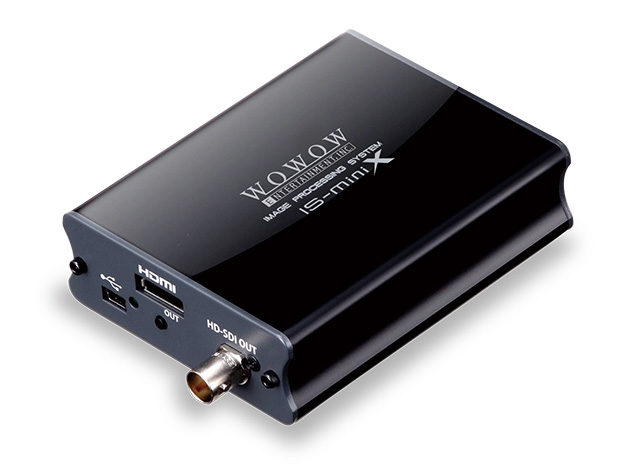 WonderLookPro is also available of these maker provided IDTs but we are recommending to use WOWOW's original IDTs, which are made by the measurements by us. Why should we make and provide our own IDTs taking not so small effort? The primary reason for it is to achieve more accurate camera matching. Making IDTs maker to maker will bring some errors because of the differnce of the measuring embironment or method of calculations. Making IDTs under the same condition and same method will contribute to less error, much more accurate camera matching. In the first place, there are a lot of cameras which IDT has not provided from maker. We make IDTs for these cameras to make full line up of IDTs for as many cameras as we can. Adding to that, thanks to the measurement of camera itself, we have camera's dynamic range information at the same time. Not only dyanamic range value to be compared with different cameras but like CV value for camera saturation, which is useful to decide exposure condition on-set. IDT consists from two parts, one is "Tone Curve" transform, which converts camera's log space into linear space, and another is "Primary Conversion" which convers camera RGB primary to ACES primary. First transform is by "normalizedLogCToRelativeExposure" function, which converts Log to linear. Next conversion is 3x3 matrix calculation which converts camera RGB into ACES rgb. To make IDT, we have to get parameters for these two transforms, the shape of tone curve, and coefficients of 3x3 matrix. 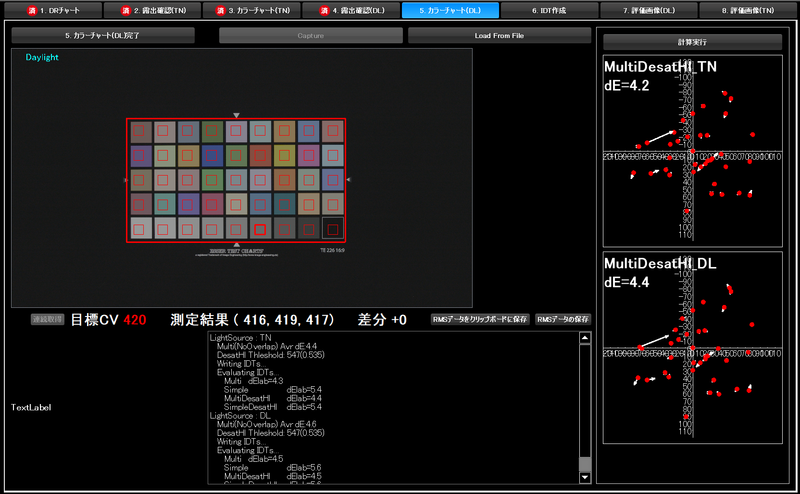 But in reality, real camera has not ideal spectral sensitivity, which brings error when transfering 3x3 matrix to ACES. To make IDT more accurate, we have to add another method to reduce the error. WOWOW is making IDTs by the camera measurements under the dark room with following devices. max 4000lx. 22ch differenct spectrum of LED light can make various spectrum of light. There are spectrum measurement probe inside to make auto calibration. Equitable for 40 kinds of filters. 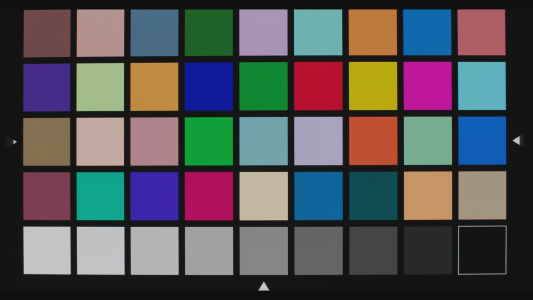 Transparent chart of 36 colors and 9 brightness of gray. 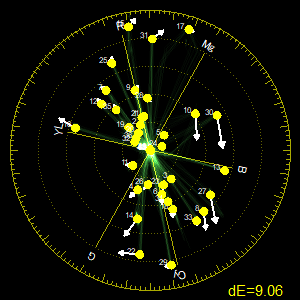 Adding LE7 control, a couple of brightness measurement is used for calcuration of IDT. The image output from camera in HD-SDI/3G-SDI is captured by IS-100 or IS-miniX. If necessary, we will cake IDT from RAW developed image. It is made specially for IDT creation. 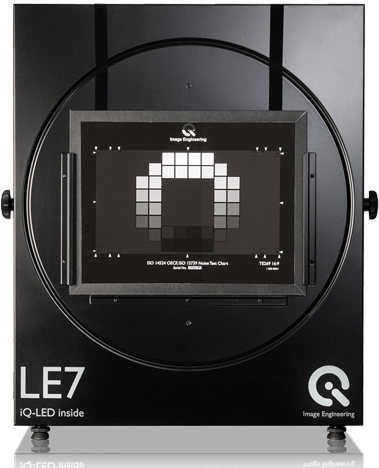 Control of LE7, IS-100 and IS-mini, manage captured images and extracted data, calculation of IDT and creation of CTL. 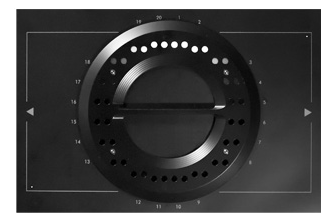 It is designed to support whole workflow from camera measurement to created IDT evaluation. Here is the patches data we are using to measure camera's dynamic range. The patch's maximum density is 5.33, it means 17.77stops range can be measured in one shot. 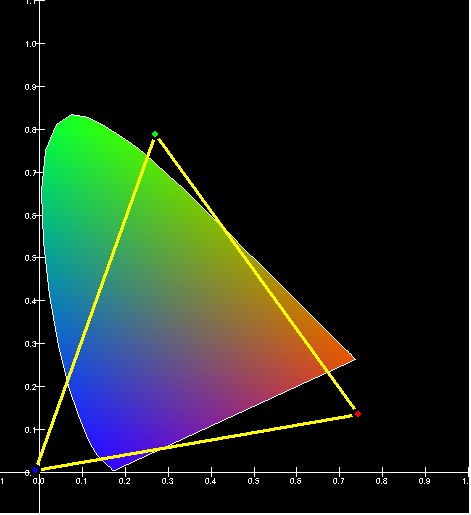 Here is the measurement example for SONY F-55's SLOG3 mode with SLOG3 definision curve based on SONY's white paper. 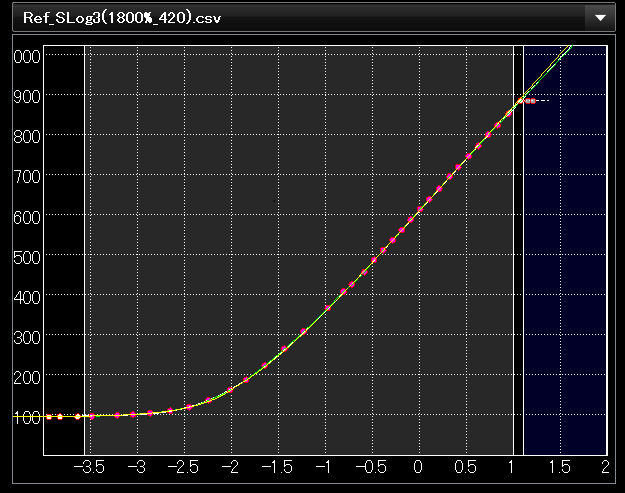 Horizontal axis is LogE, vertical axis is 10bit code value from the camera. 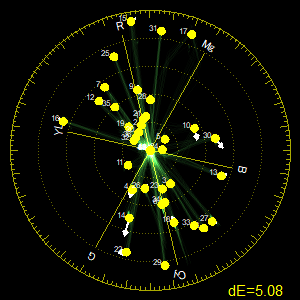 40 red circles are the original measured data, yellow curve is the SLOG3 definition. As you can see, our system is capable to measure the dynamic range by one shot with good accuracy even for wide dynamic range camera. The above example shows that the measurement and SLOG3's definition matched very well and it means our measurement has a good enough accurary with makers one. 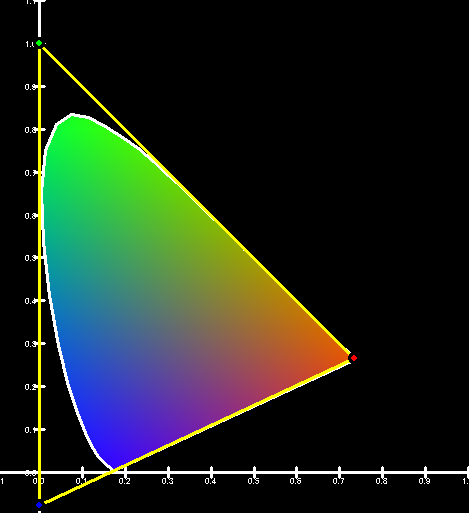 Typical IDT, mostly provided from camera makers, consists from tone curve which convers Log to linear, and 3x3 matrix which converts camera color to ACES primary. This simple procedure is easy to calculate inverse transform, which is very convenient. But one 3x3 matrix can not remove non-linear error of primary conversion. WOWOW implemented our own method to reduce this error by deviding the color spaces into a couple of regions and calculate the optimal matrix for each region. By this method, we could make good precision of IDTs. But we are still on the way to inprove the quality of IDT and still studying how to improve the presision and remove the erros. 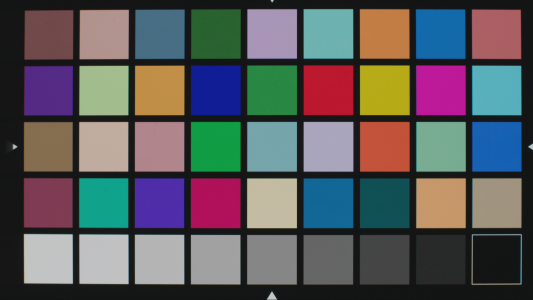 Here is the diagram of primaries in xy chromaticity, left is SLOG3 and right is ACES primary. If there is no error in camera's spectral sensitivity and there is no errors in camera calculation, we can get ACES primary by following calculation. 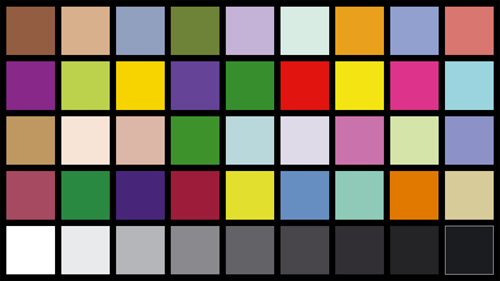 Let's chekc the result by using color chart. F-55's SLOG3/SGAMUT3 will be used for the reference. First, here is the rendering result of F-55's image, by WOWOW's IDT, RRT and rec709 ODT. Next, here is the result by using SONY provided IDT. 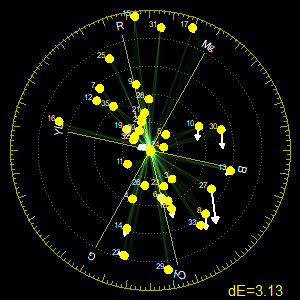 The image and vector scope with deltaE value are shown. 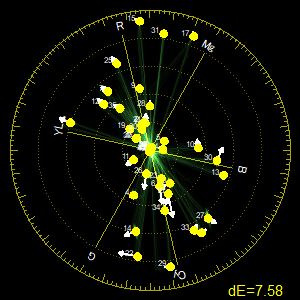 The top of the arrow of the vector scope targets the color of WOWOW IDT's result. Longer the arrow the bigger the difference between WOWOW's IDT and SONY's IDT. "deltaE" means average color difference value, the smaller the value the smaller the difference of colors. The value is calculated by ACES color value just after the IDT process and averaged for all 40 colors. The value 3.13 is not so big. Vector scope shows blue or purple colors have a little bit bigger difference. We show measure the color of the chart again to evaluate which is much closer to the real object color. We can understand that the difference of how to create IDT might bring these minor errors. Next, we will show the result of Panasonic Varicam LT. The reference is F-55 by WOWOW IDT. 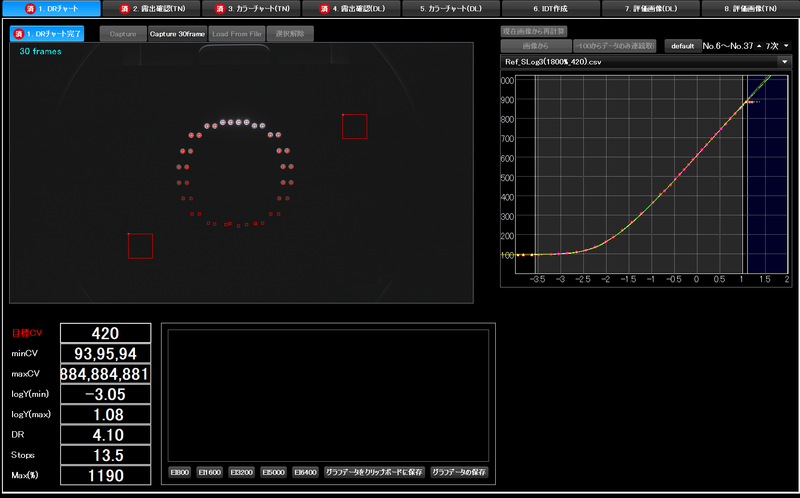 Again, the deltaE is calculate the difference form F-55 by WOWOW IDT. The deltaE value by WOWOW IDT is 5.08, and the value by Panasonic IDT is 9.06. It means WOWOW's IDT is much close to F-55 result. Next, we will show ARRI AlexaMINI's result. 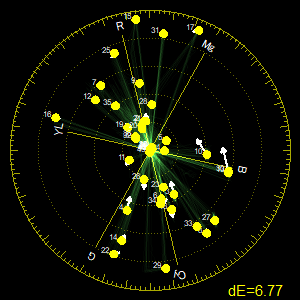 The average deltaE shows that 6.77 for WOWOW IDT and 7.58 for ARRI's IDT. 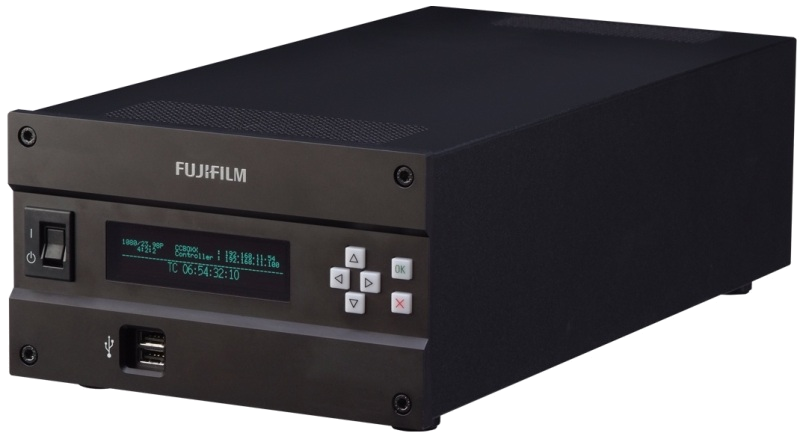 WOWOW's IDT is a little bit closer to F-55, but these are not the big difference. On the vector scope, we can observe rather big error for blue or purple on WOWOW IDT's result. For ARRI's IDT result, there is no big error colors but many color have a little bit big error than WOWOW's IDT result. Regarding gray scale, all of the results are within affordable error, for any cameras, by any IDTs. We showed the comparison of WOWOW's IDTs and each maker provided IDTs. The result say, there are not so big difference for any IDTs, but it would be better to use WOWOW's IDTs to minimize the error between cameras. We will continue to measure new cameras to provide new IDTs and will continue to investigate the method to create much better quality IDTs. Here is the list of cameras WonderLookPro is providing IDT.